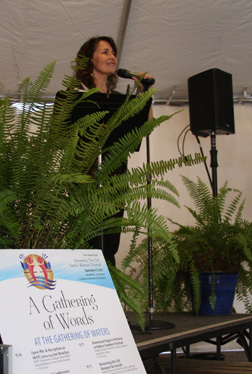 Kim at Returning the Gift Festival, 2012 in Milwaukee, Indian Summer Stage. In this special evening of poetry, members of the Wisconsin Fellowship of Poets (WFoP); Wisconsin's Poet Laureate Kimberly Blaeser; Madison’s Poets Laureate, Sarah Busse and Wendy Vardaman; and other invited poets will read original works inspired by Eric and Heather ChanSchatz: 22nd Century. You too are encouraged to share your vision(s) of the city through Twitter using #writeyourmadison. All tweets sent by February 15 will contribute to a group collage poem that will be performed at the event. Write Your Madison is a digital place-making project by Madison's Poets Laureate and Cowfeather Press that invites collaboration and conversation through poetry about Madison. Learn more at Cowfeather Press. Poets Respond to Madison is organized in conjunction with Eric and Heather ChanSchatz: 22nd Century and the artists’ project, Madison: A Cooperative Almanac, by MMoCA’s education department in partnership with the Wisconsin Fellowship of Poets (WFoP) and Madison’s Poets Laureate. MMoCA Nights admission $10/Members free. © 2019 Kimberly Blaeser | All Rights Reserved | Web Design by CCS, Inc.